This scholarship guide was created by program staff at The Community Foundation of Muncie & Delaware County, Inc. to provide guidance and tips to students who are applying for the Foundation’s scholarships. Scholarships at The Community Foundation are competitive. Writing essays, gathering activity information, and coordinating letters of recommendation can take a significant amount of time. We hope that this guide will provide you with the tools to submit a scholarship application. Think of applying for a scholarship as auditioning for a play: you’ve put the time and energy into preparing for a great audition, but sometimes you just aren’t the right fit for the part. Just because you don’t get cast for a role, doesn’t mean you quit auditioning. You keep working and trying to win the best role - or in this case, the best scholarship. Use of this guide in no way guarantees that a scholarship will be awarded. The Community Foundation operates two scholarship cycles: the Lilly Endowment Community Scholarship from July 1 to early September; and all other scholarships from January 1 to March 1. All scholarships applications are available online. Applicants must create a username and password to apply. Once registered, students will be able to keep track of their information for the entire scholarship process from application to award in the online account. To get started, you will complete a common application (think of a survey) that will match you to the scholarships that you qualify for. After completing the common application, you will be directed to your dashboard. 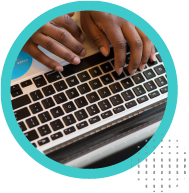 The scholarships you are eligible to apply for will appear on your dashboard, along with the follow up actions required to submit your application. The scholarship software requires each section to be completed before submitting the application. Think of your scholarship application as a job resume; this is the first impression the selection committee will have of you. Don’t be afraid to boast about your accomplishments! What will make you stand out from all of the other applicants? What will get the reviewers attention? Your application is your only chance to show why you deserve this scholarship. Start your application early. Your application will require external uploads from people like your guidance counselor and references, and if they don’t complete those requests before the deadline your application could be disqualified. Since it takes more than just your effort to complete the application, be respectful of other people’s time. Once you preview your application, work offline or in a document that you can keep safe on your computer or take home. Reusing scholarship information like essays and references are a great idea, but once the scholarship cycle is over, you won’t be able to access your application again. Be sure to keep your work where you can access it on your own especially if you are working on a public computer (like at school or the library). Before you submit your application, ask a friend or a family member to read through your answers. Someone else is more likely to catch any errors even on simple answers like your address or phone number. Proofreading is essential! If you have any questions during your application, you should first consult with your Guidance Counselor, then email scholarships@cfmdin.org. The Community Foundation utilizes an Extracurricular Activities Form for students to provide details about time spent outside of school. The form is available as a download on the Extracurricular Activities section of the application. Save the form to your desktop or flash drive before working on it. The form is divided into sections by types of activity. Please don’t change the font or add additional formatting. If you do not have information for a section, then skip it and leave it blank. If you need additional lines, then you can add them. Once you’ve completed the Extracurricular Activities Form, you should save it to your desktop or flash drive. Upload it to the Extracurricular Activities and Employment section of the application. Double check the uploaded file to make sure that everything saved properly by clicking on the file name and downloading it to your computer. Athletics – List school associated athletic teams, as well as club and travel teams. 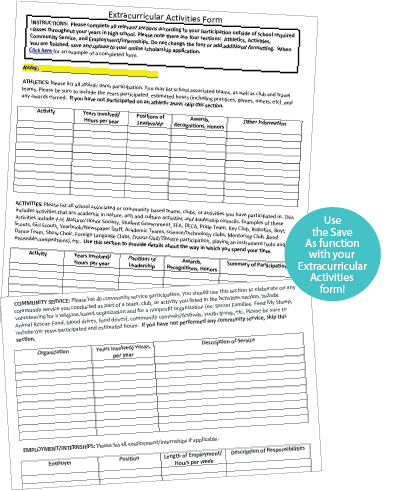 Activities – List all school associated or community-based teams, clubs, or activities you have participated in. This includes activities that are academic in nature and arts/culture activities. Examples of these activities include 4-H, National Honor Society, Student Government, Key Club, Robotics, Boys Scouts, Girl Scouts, Yearbook/Newspaper Staff, Academic Teams, Mentoring Club, Band, Dance Team, Show Choir, Foreign Language Clubs, Drama Club/Theatre participation, playing an instrument, etc. Community Service - Use this section to elaborate on any community service you conducted on your own, or as part of a team, club, or activity you listed in the Activities section. Include volunteering for religious based organizations and for nonprofit organizations. Examples of these activities include Secret Families, Feed My Sheep, Animal Rescue Fund, blood drives, food drives, community carnivals/festivals, youth group, etc. Be sure to include the years participated and estimated hours. Employment/Internships – List all employment and/or internships. The years you were involved - ex. 9th grade. The hours per year you were involved – ex. 9th grade/120 hours. Be sure to account for your hours appropriately. Take into consideration practices, meetings, games, etc. Positions of leadership such as captain, practice leader, vice president, etc. Letters, awards, recognitions and honors received or earned such as varsity letter, All-Conference, etc. Additional information that the committee might not know about; things that are above and beyond the typical participation. For community service and employment/internship sections, use this column to describe the responsibilities or the tasks associated with the position. 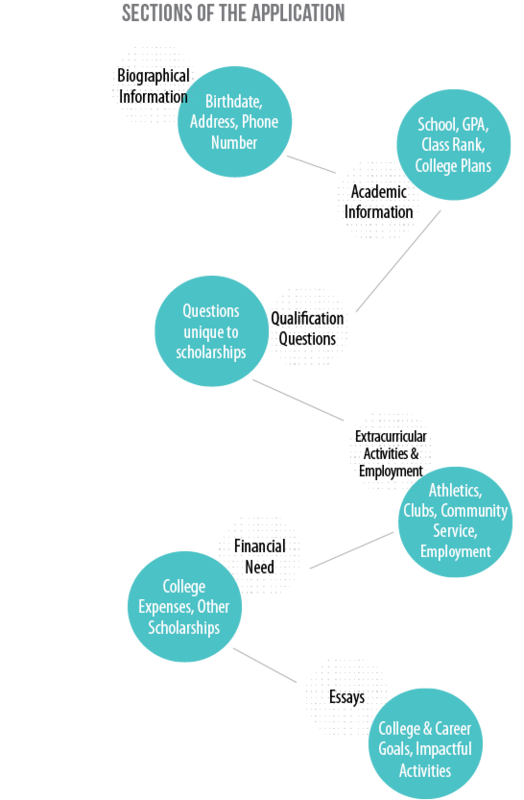 The Financial Need section of the application evaluates the applicant’s anticipated financial need for college and how they plan to pay for it. Scholarships available through The Community Foundation, with the exception of the Lilly Endowment Community Scholarship Program, can be used for any cost associated with attending school – tuition, room and board, fees, transportation, etc. However, all scholarship payments are sent directly to the university/college of the recipient. What are your estimated expenses for your first academic year in college? While this question only asks for you to provide an estimate, it’s important that you do adequate research to know what to answer. Information about the estimated costs for college can be found by looking at the financial aid information at the college(s) you’re interested in or by using online resources such as the College Cost Estimator. Students should not send or otherwise attempt to upload any information from their FAFSA or any online college cost estimator or calculator. Students are not required to submit any financial information from their families or their FAFSA. Most scholarships have a definite award amount, so it is very unlikely that you will receive a scholarship that covers your entire need. How do you plan on financing your college education? This is your opportunity to write about how you plan on paying for college, and why you need scholarships to help pay for it. Be specific. If you plan on searching the ends of the earth for scholarships and grants, then talk about that. Include information about any sort of program aid you have qualified for such as 21st Century Scholars, Pell Grants, or work-study programs. Explain if you are receiving help from family or parents, or plan to pay for college all on your own with savings or loans. Be as specific as possible. The Community Foundation of Muncie and Delaware County requires a letter of recommendation for each scholarship applicant. Letters of recommendation are attached to each application through an external request form. Applicants do not have access to the content of the recommendation. Therefore, when selecting a person to be a reference for the recommendation, it is important to consider what they may write about you. Be sure to pick someone who can write about your character, accomplishments, and personal leadership qualities. Your letter of recommendation should speak to things not otherwise discussed in your application. A letter of recommendation should speak to your activities, achievements, academics, and/or personal leadership qualities that are not otherwise mentioned in your application. It can be written by a teacher, mentor, coach, or someone else in your life that can provide a strong endorsement to why the scholarship committee should invest in your education. It should not be from someone related to you. The Community Foundation’s common application has two required essays that all applicants must complete. Additionally, there may be other scholarship essays required by specific scholarships. The additional essay requirements, if any, will be available in the applicant’s dashboard after the common application has been submitted. Scholarship essays are used to help the selection committee get to know you better, and to further prove your eligibility for the award. You don’t have to be the best writer to receive a scholarship award. Crafting a thoughtful and honest essay is possible if you take the time to reflect on how the essay question relates to you. As you begin working on the essays, thoughtfully consider what the essay question is asking. 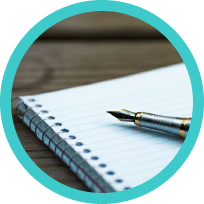 Develop an outline about what you plan to discuss. Consider an introduction, body with main points, and conclusions. Use your voice and be honest. Help the committee can feel like they can get to know you. Aim to showcase your strengths, passions, and personality. Your GPA and extracurriculars are well-documented elsewhere. Essays are your opportunity to go in-depth on one or two of your accomplishments. Watch your word choice. Big words don’t impress a scholarship committee. They’re more concerned with content, spelling, and grammar than word choice. This includes eliminating any buzzwords or slang. Use complete sentences and make use of the word count. If a question has a word limit of 500 words, then it is unlikely the response can address the prompt in only 100 words. PROOFREAD – ask a friend, teacher, parent, anyone! Rewrite and revise as needed. Make sure your essay is free of any grammatical or spelling errors. If you receive any scholarship, make sure to follow through with any additional requirements. The Community Foundation typically asks for your contact information, parent/guardians names, college name and major, and college/student ID number. This information is very important because it is needed to process scholarship payments that are made directly to the college or university. 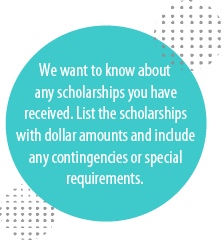 There are several other places to look for available scholarships, so don’t let The Community Foundation be your one and only stop! Visit your school’s guidance counselor. They are a great resource for scholarships, and are usually the main contact for local scholarship providers. Contact your College/university (or potential college/university) to see what scholarships they may have available. Sometimes there are scholarships available for certain majors, first generation college students, commuters, etc. Consider the groups you’re involved with or the church you attend - do they offer scholarships to their members? You can find other scholarships through online resources such as Petersons.com, Scholarships.com, and Fastweb. These websites provide other great tips in regards to college, such as degree types, financial aid preparation, college costs, and SAT/ACT prep. 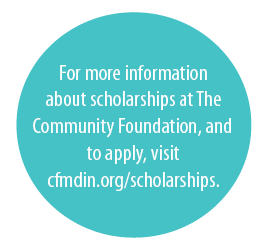 The Community Foundation offers scholarships for students pursuing post-secondary education. Scholarships are available for high school and college students.